This was my first experience making a fabric book. It looks handmade, naïve and simple. There are a few mistakes, but it was certainly made with love. Scissors, iron, pins, threads, sewing machine – of course. Buttons, ribbons, rickrack, etc for decorations. I cut out a template for pages 17x16 cm, 1 cm seam allowance included. For the cover, I cut one piece out of a checked fabric, one out of calico and two of iron on interfacing on fold. For the remaining pages, I cut out one piece out of calico and one out of iron on interfacing for each letter and appliqué. In total, two of calico and two of interfacing for one page. First, I prepared appliqués. While my appliqués were cooling down, I ironed interfacing onto the wrong sides of all pages and cover. Then I cut out appliqué pieces. My desk looked very busy and colourful! Next – I ironed appliqués onto calico pages. Make sure you take into account which side of a page is going to be sewn into the cover and work out the centre of the page accordingly. When I was making Jonas’ book I made a mistake and ironed on pictures and letters allowing 1 cm on the same side. Oops. Now I had a pile of pages. It was time to stitch around letters and pictures. I was going for a somewhat rough look, so I used Zigzag stitch. 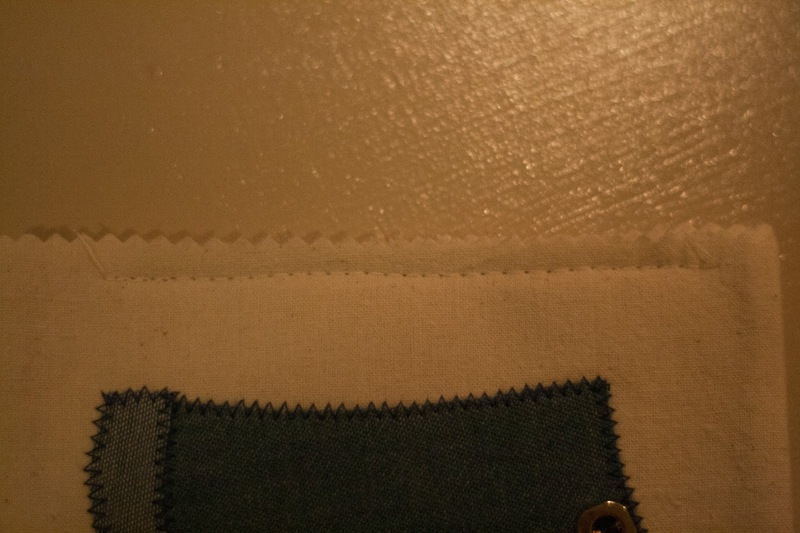 stitched around 3 sides and trimmed the corners as well as the fabric along the seams (just makes things look neater). Turned inside out… Pressed. Repeated for all remaining pages. To make the cover, I marked where I wanted Velcro to go, stitched it on and then followed the same steps as for making pages. Just leaving a small opening on the back cover where the strap would go. Now it was time to make a small strap. I cut a rectangle out of the same fabric I used to make the cover for the book, stitched three sides together, cut the corners, trimmed the fabric along the seam, turned inside out, pressed, and stitched Velcro in place. Once the strap was ready, I put all the pages inside the cover to see how far the strap had to go into the opening on the cover so it closed nicely. Then I trimmed the strap and stitched it in place. In fact, I stitched all around the cover of the book as I thought it would look nice. Next, I put all the pages one on top of another and machine basted them together. Then, I placed pages inside the cover, hand basted them in place again and stitched them using my machine. I think I should have used a walking foot because my machine nearly ‘choked’ sewing this. I carefully marked where I wanted the head of the octopus to be. I cut eight pieces of rick rack, tied knots on one end to prevent them from fraying and pinned them in place. I stitched just inside the head to secure them. I didn’t want the Octopus to loose its legs after only a few read/play sessions. ... then I stitched around using a Zigzag stitch and hand embroidered the face. What a wonderful present, Jenya!!! I've seen lots of fabric books, but never one done with the letters of a child's name... very clever!!! And well done on your Tutorials Page... hope you'll add it to the Sewing Tutorials link party and this post to the Softies, Dolls and Toys (no pressure here... LOL!!!) Hope you don't mind, but I'm pinning. This is great! Love all the textures. enJOYed the brainstorm you gave me. Cute fabric book!!! I love the cover, the apple, and octopus! I'm pinning this!